The Old Foodie: Wonder(ful) Bread? 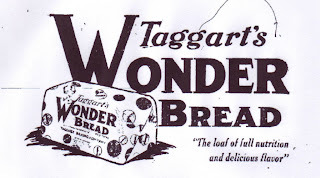 I've lived in the US for 36 years and after my first experience of Wonderbread have never, if an alternative is available, purchased either it, or one of its generic brothers or sisters. It is known "en famille" as "concertina bread", since you can hold a plastic-wrapped loaf at either end and push it in and out, with the same physical result - other than sound - and no more resistance than you would expect from a concertina. An overriding taste, of it and of the majority of American breads - even speciality and organic ones - is of sugar (in organic breads the sweetening agent is frequently honey). The basic flour, water, yeast & salt loaf is almost unknown on this continent. Hello Roger. What amazes me is that all these "modifications" of bread across the last century have been called "improvements". What was there to improve in the first place? I do have a copy of the Hess's book, but have not opened it for a very long time. A classic, and definitely worth re-reading. While I don't have specific evidence to back this up, I believe that Wonder Bread was really directed at children, and was part of an effort to create visually appealing products that children would request. The "red, yellow and blue balloons" printed on the package were even mentioned as part of the advertising, telling children to look for the balloons. In effect, it falls into the category of heavily marketed sugared cereals, packaged cupcakes, Twinkies and the like. Fortunately, there is a movement towards whole grain and artisanal breads in the US, but the marketers continue to plug away as well. The best thing about Wonder Bread (and similar "breads") is that it makes great bread pills for your sick dolls. Henry Miller wrote an essay on American white bread called "The Staff of Life" that is quite rude and quite true -- well worth reading.